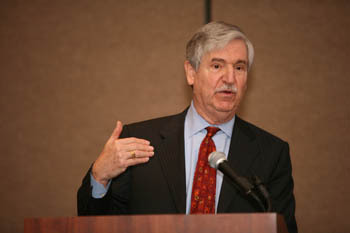 TAMPA, Fla. -- Thirty-one years to the day after he was taken hostage in the U.S. Embassy in Iran, former career diplomat John Limbert said the U.S. and Iran will never move beyond its three-decade-old standoff unless it is willing to put the “ghosts of history” behind them. Now a professor at the U.S. Naval Academy after retiring from a long career in the Foreign Service, Limbert said not only did he never expect his captivity with 51 other Americans to last 444 days as it did, he never would have expected that three decades later there would be no progress in the two nation’s relationship. During those years, a series of “rules” seemed to have evolved to control the relationship, and any attempt by U.S. administration to change the nature of that relationship seems to have run afoul of these rules. At the top of the list: “Never walk through an open door if you can bang your head against the wall instead,” he said. And the others: Never say “yes” because you will look weak; anything the other side proposes must be a trick; and the other side is infinitely devious, hostile and irrational. Limbert noted the Obama administration has made small but subtle attempts to change the tone of the back-and-forth with Tehran, only to see Iran’s nuclear ambitions and the continuing and what appears to be Iranian President Mahmoud Ahmadinejad’s inability to respond. But Limbert cautioned the crowd to look for the small signs of progress. Following the recent decision by Washington to list Sunni militant group Jundallah as a terrorist group, Limbert noted that in demonstration’s marking the anniversary of the hostage crisis protestors shouted “Death to America” but didn’t burn an American flag – for the first time since those annual demonstrations began. Limbert’s lecture capped the two-day event, which also featured Wednesday talks by Lt. Gen. John R. Allen, Deputy Commander of U.S. CENTCOM and Roger Cohen, foreign affairs columnist for The New York Times and the International Herald Tribune. For two days, panelists featuring some of the leading international thinkers on Iraq, Iran, Afghanistan and Pakistan probed the complex political landscape of the region and the difficult process of creating free and functioning democracies. The conference is the brainchild of Mohsen Milani, chair of USF’s Department of Government & International Affairs, who knows the convoluted issues of the region well as one of the nation’s leading experts on Iran. Milani hoped the conference would help aid the understanding of the complex religious, political and cultural forces at play and lay the groundwork for future solutions. Among the conference attendees were representatives from Central Command as well as Afghanistan and Pakistani military officers who are stationed at Central Command as part of the international coalition. “There are no other four contiguous countries in the world that pose a greater challenge to American national security than do Afghanistan, Pakistan, Iraq, and Iran,” Milani said. “Although they have profoundly different histories and political systems, elections have been playing an increasingly important role in all of those countries. The event carries forward the university’s on-going focus on politics, war, health and humanitarian issues in the region, which were the focus of a three-day conference in March that drew leading authorities on Afghanistan and Pakistan and featured a lecture by then CENTCOM Commander Gen. David H. Petraeus.